You may or may not know Marie King. Marie is the bar manager at Don The Beachcomber in Huntington Beach, California. DTB is, of course, the former bastion of the Tiki movement that one Donn Beach once held court in as he introduced the world to drinks like the Zombie (and the 34 other varieties thereof) and a few dozen other classic Tiki drinks (be sure to have your eyedropper of absinthe ready). About a month ago Marie was driving on the Santa Monica Freeway (I-405) near Downtown Los Angeles when she was involved in a near fatal accident. She suffered numerous serious injuries, some which will/have require(d) surgery to repair. 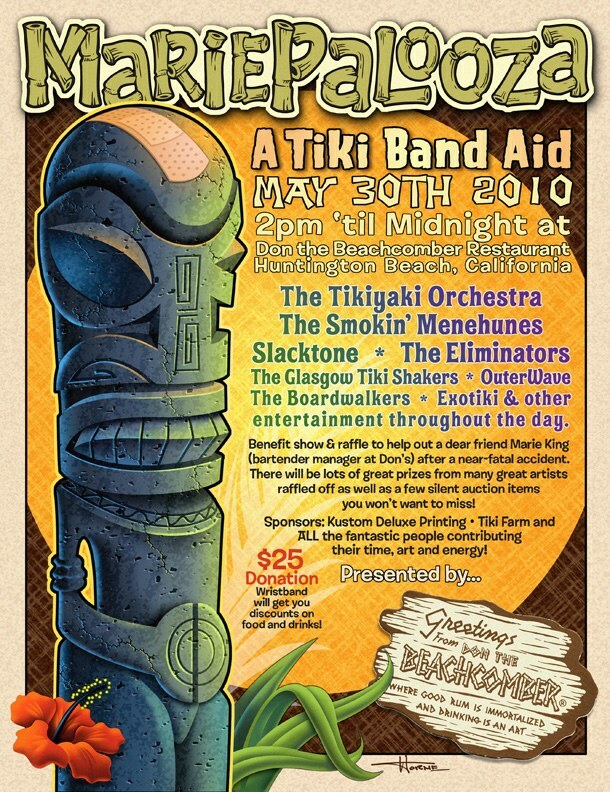 The local Tiki community has sprung into action to try and support Marie as best they can, and, with the cooperation of Don The Beachcomber Restaurant, they’re holding MariePalooza this Memorial Day Weekend. On Sunday, May 30, from 2pm until midnight there will be music, deals on food and drinks, and even some Tiki memorabilia for auction. A $25 donation gets you a wristband to take part in the festivities, and you can buy your tickets here. If you can’t make it because you have plans or you choose to live in some place other than Southern California where beneficial Dood-rays have been known to help bring about bumper rum crops in liquor cabinets, please consider still making a donation. I hope to see a lot of friendly faces there. I know that some of Orange County’s best bartenders will be in attendance (work-schedules-permitting) to show their support as well. Mahalo to Humuhumu for the fez-tip on the event. 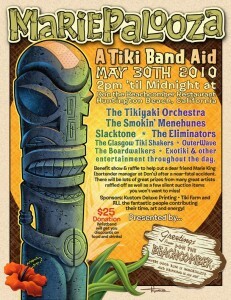 This should be amazing event with tons of bands and some amazing tiki art available for raffle and auction. Can’t wait! I hope the event went well and a good bit of money was raised on Marie’s behalf. Totally coincidentally, my wife and I were in southern CA yesterday, but unfortunately we had to fly out at noon after a wonderful week-long visit that included stops at Tiki-Ti, Trader Vic’s Hollywood, and Varnish, but not Huntington Beach Don the Beachcombers. To tell the truth, I didn’t even know there was a DTB in operation until reading this post. Did this venue just open up in the last year or two? Previous post: Mai Tai Madness: The Winners!